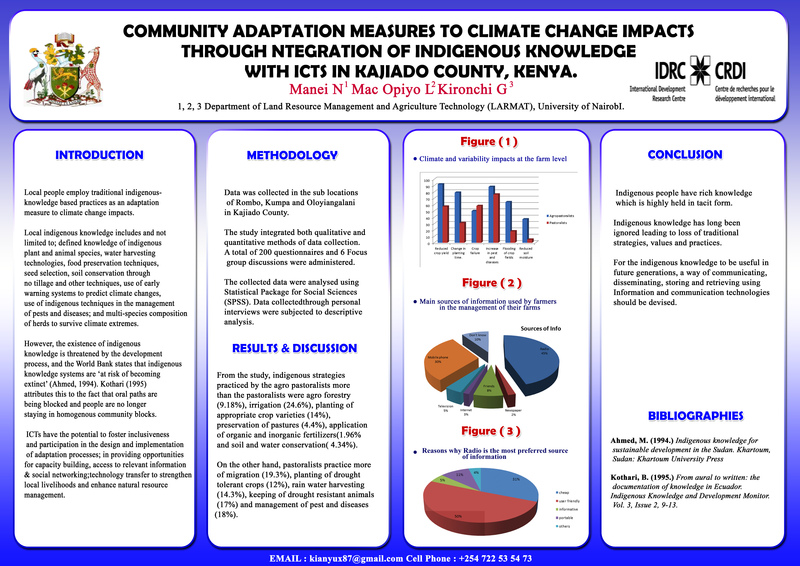 Local people employ traditional indigenous based practices as an adaptation measures to climate change impacts. Local indigenous knowledge includes and not limited to: defined knowledge of indigenous plant and animal species, water harvesting technologies, food preservation techniques, seed selection, soil conservation though no tillage and other techniques, use of early warning systems to predict climate changes, use of indigenous techniques in the management of pests and diseases, and multi-species composition of herds to survive climate extremes. However, the existence of indigenous knowledge is threatened by the development process, and the World Bank states that indigenous knowledge systems are 'at risk of becoming extinct' (Ahmed, 1994), Kothari (1995) attributes this to the fact that oral paths are being blocked and people are no longer staying in homogenous community blocks. ICTs have the potential to foster inclusiveness and participation in the design and implementation of adaptation processes; in providing opportunities for capacity building, access to relevant information and social networking, technology transfer to strengthen local livelihoods and enhance natural resource management.